“No. Forget it. I’m just going to stay home!” My 16-year-old son angerly shut the door to his bedroom late one afternoon, also shutting down our conversation. It was the fourth of July and a few of his friends were going to have a sleepover at one boy’s house that evening. Normally, he would have asked permission to use the car and we would have granted it. However, a few weeks earlier, his license had been taken away. Oh, not by us. By the state of Michigan. Our state has laws for 16-year-olds who drive. They may not transport more than one person who is not an immediate family member. Nor may they drive past 10 PM. Our son’s circle of friends had been out at the local diner one night past ten, driven there by one boy who was over 16. Because he was older, he didn’t have the same stipulations on his driving that my son did. However, when they went to pay and leave, that boy realized he didn’t have his license on him. They decided that they’d better not risk this boy being pulled over and caught without his license. So, my son drove them back to our neighborhood, less than two miles away. When they were almost home, the red and blue flashing lights of a police vehicle interrupted their quick outing. My son got pulled over. Questioned. Busted. Not only was he driving past curfew, but he also had three unrelated passengers in the vehicle with him. He was fined heavily and ordered to pay for an online driving refresher course. His license was also taken away for two months. My husband and I took no additional disciplinary action, determining the state’s consequences were dishing out the all the disciplining needed quite nicely. When he couldn’t find another ride to the July 4th overnight, we offered to take him, but he didn’t want us to. And so, this never-misses-a-party kid stayed home. Alone in his room and hopping mad—at the state of Michigan and probably at himself. Perhaps he was embarrassed that he couldn’t drive. (We never did find out if he ever told his friends about his license being suspended.) However, something caused him to pass on our offer of a ride that night and stay home to sulk in his room instead. I was ready to knock on his door and give him a little perspective, by way of a lecture—you know, telling him that if he’d just obeyed the law of the land, it wouldn’t have landed him in so much trouble. I also didn’t feel he had exhibited true remorse for his actions. He only spoke of what a “dumb law” it was rather than saying he was sorry he broke it. However, about the time I was to embark my latest lecture tour, a verse popped into my head. Our Father God’s grace-filled kindness leads us to repentance. Not his parental this-is-your-own-fault-anyway lectures. It was then that God gave me an idea. Instead of spending my time lecturing, I went into the kitchen and whipped up my son’s very favorite dinner—fried chicken sandwiches, cheesy potatoes, and a peanut butter apple crisp—even though what I’d planned to serve was leftovers. When I hollered to him that dinner was done, he still didn’t want to come out of his room. That is, until I told him what was for supper. We ate dinner, mostly in silence. Then, my husband and I told him we were going to watch a movie and asked if he’d like to join us. We also offered to let him pick which movie to watch. At first, he wasn’t onboard, but later he did emerge from his room, sat down beside me, and together we all watched a movie he chose. His July 4th was spent, not with his friends, but hanging out with his parents instead. By the end of the flick, he was snuggled up close to me, with his head on my shoulder, and no longer fuming mad. When the movie was over, we conveyed to him how sorry we were that things weren’t going well for him, refraining from any lecturing. I told him I didn’t like seeing him unhappy and I wanted to do whatever I could to show him that, even though he had broken the law, we still loved him like crazy. And we also empathized with him, letting him know we understood that—because he is someone who always looks out for others—he had made the choice to drive that night because he was trying to save his friend from getting in trouble. Sometimes when our children are walking through the consequences of their actions, they need to be lavished with extravagant grace. Piling on more punishments, more lectures, more shame—it doesn’t help them to come to a place of true remorse and repentance. If God’s kindness leads us to repentance, maybe our gracious kindness as parents can also help our children come to demonstrate true sorrow for their actions. So, the next time everything within you wants to lash out and lecture, try scattering a little undeserved grace and kindness instead. Extravagant grace can be the place where God not only meets your child, but where he deepens your relationship with them as well. P.S. We’re growing in grace together all month here at The Better Mom. 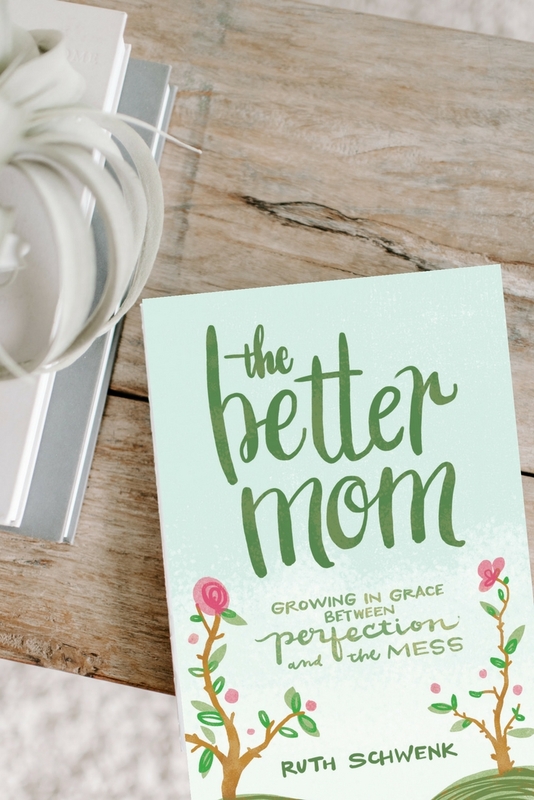 PLUS, The Better Mom book releases on Tuesday! Find out more here. Karen Ehman is a New York Times bestselling author, Proverbs 31 Ministries speaker, and writer for Encouragement for Today an online devotional that reaches over 4 million women daily. Her latest book Listen, Love, Repeat: Other-Centered Living in a Self-Centered World, is full of ideas for scattering kindness to family, friends, strangers, and the "necessary people" who help you get life done. A wife and mom of three, she resides in central Michigan where she enjoys cheering for the Detroit Tigers and processing life with the many teens that gather around her kitchen island. Connect with her at karenehman.com where she helps women to live their priorities and love their lives.